It's Chriiiiiiistmas! Well, obviously not quite yet, but there's a chill in the air, Christmas lights are sparkling all over town, and I've already scalded myself on glühwein. 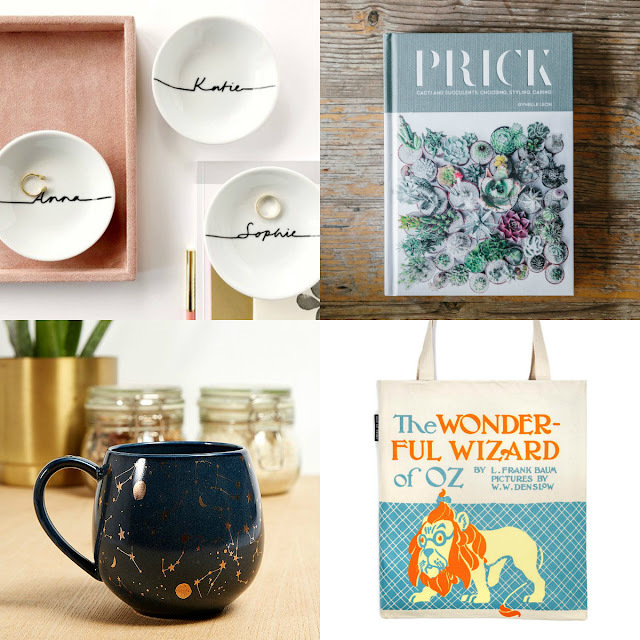 With only four weeks to go, it's time to get cracking if you've still got Christmas shopping to do! 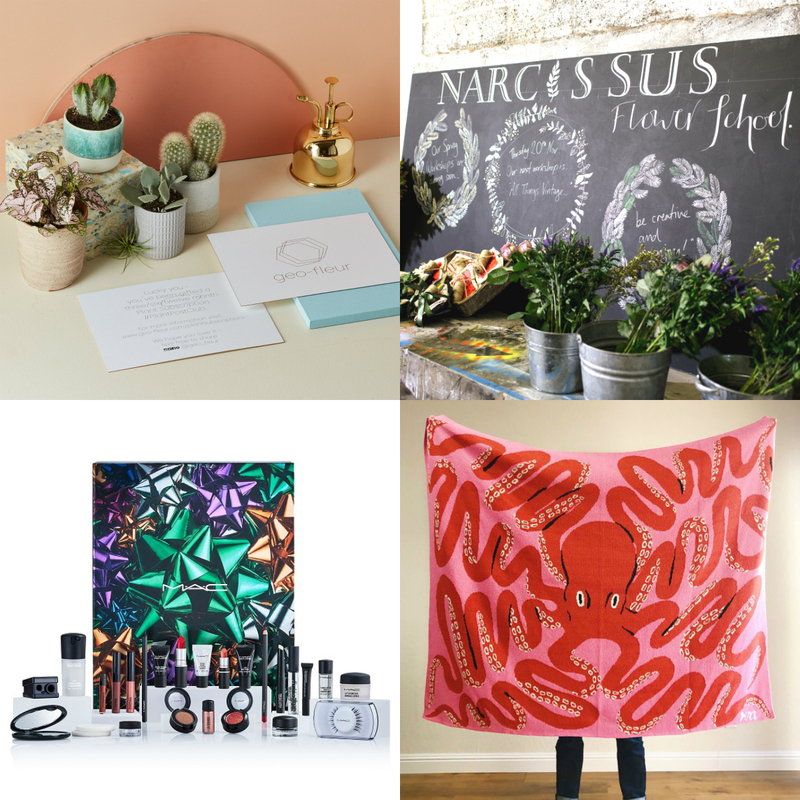 I've put together a list of lovely things, with ideas for most budgets, to give you some Christmas inspo. 1. How cute are these sleepy moon pin badges? They come hand-stamped with your choice of initial for a personalised touch. 2. 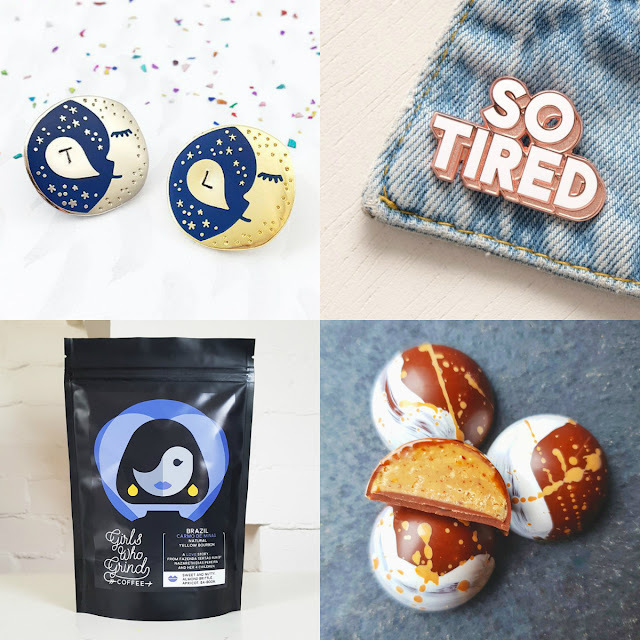 These are aimed at new mums, but as someone who is a fan of staying up late and dozing all day, I loooove this So Tired pin. 3. Got a coffee lover in your life? Get them hand-roasted coffee beans from all female coffee company Girls Who Grind. 4. Fusing art and chocolate, you won't go wrong with beautiful chocolates from Glasgow-based Sugarsnap Chocolate. 1. An adorable gift for anyone with jewellery or trinkets to store, this ring dish is personalised with your choice of name or word. 2. I got this Prick Book last Christmas and it is brilliant! It looks beautiful, is packed full of interesting information about cacti and succulents, and is a great guide for your green-fingered friends. 3. You can't go wrong with a really pretty mug, and this celestial print mug is lovely. 4. Featuring artwork from the first edition of the book, buying this Wizard of Oz tote bag helps to fund literacy programs and book donations to communities in need, so you can get a gift and help others out! What a wonderful wizard win/win. 1. How cute is this chubby ceramic rhino planter? Very cute, that's what. 2. I'm a big fan of indie jewellery label Wolf & Moon's aesthetic, and this eclipse necklace is particularly pretty. 3. 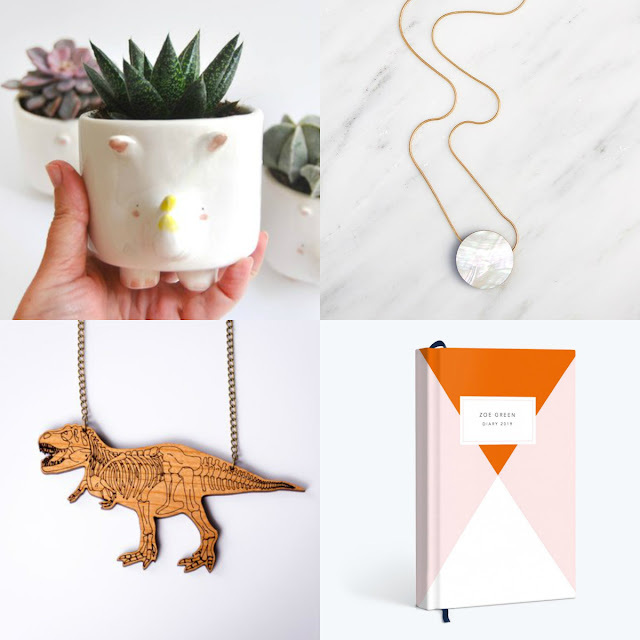 I love dinosaurs, so I'm a big fan of this lasercut T Rex necklace. It comes in gold and silver too! 4. 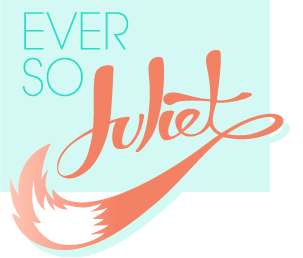 Okay, have you guessed I like personalised things? I think it all stems from having a slightly unusual name, and never being able to find anything with my name on it when I was little. Anyway, Papier have a beautiful range of stationery, including this beaut 2019 diary, which can all be personalised! 1. I'm a sucker for anything rainbow, and this bright orange bag ticks a lot of boxes. It's got compartments! Everyone likes bags with compartments! 2. 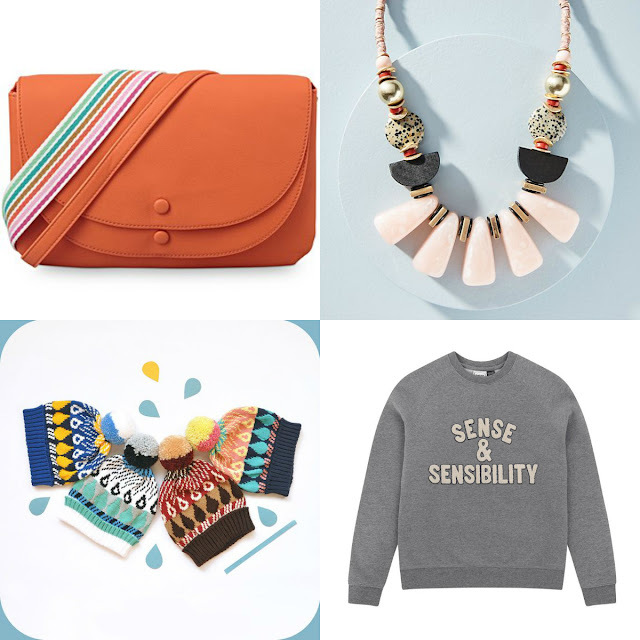 I'm pretty pleased I've managed to only pick one thing from Anthropologie on this list, I am obsessed with that whole shop (although I can never actually afford it, weep). This statement necklace looks giant and great. 3. Brighten up wintery days with this adorable handmade fair-isle knitted hat. The pom poms are detachable too! 4. Perfect for the book lover in your life, this Joanie Sense & Sensibility jumper looks cute and cosy. 1. You can never have enough plants, and geo-fleur's Plant Post Club is a super cute way to surprise plant lovers each month. This subscription delivers an exclusive package of an unusual and beautiful plant, in a handmade pot, or plant related accessories each month. Everything's made in geo-fleur's Yorkshire studio. 2. I know this is a massive list of actual presents, but I am definitely of the opinion, that if you are going to treat someone, there's nothing better than gifting a trip or experience. In Edinburgh, we're lucky enough to have beautiful artisan florists dotted around the city, and I've always wanted to do a Flower School workshop - you get to learn a new skill and take home a beautiful bouquet! 3. Okay, back to commercialism! I can't help being a sucker for MAC, and I'm clearly a makeup magpie, so look, look at the shiny pretty things advent calendar! 4. Like octopuses? Like being cosy? I do! I'm obsessed with this giant octopus blanket, hand-knitted by illustrator Kristina Micotti.